﻿Getting to and around Mammoth during snow season can be a challenge. Thanks to Sonenalp's snow removal services, dry garage and location close to the shuttle you won't have to worry once you arrive. But to get you to Sonenalp safely, here are some tips from our experience as well as CalTrans's Weathering the Storm brochure. Sonenalp at Canyon Lodge has a snow plow service that will plow the driveway and shovel the walkway to the front door at the end of every snow cycle. 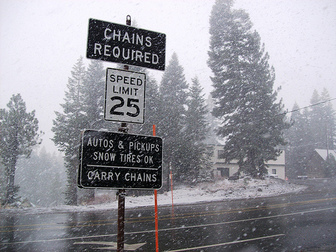 During snow cycles, snow chains are required in the Town of Mammoth Lakes and in many surrounding areas--even if your vehicle is 4WD. Streets and drives can be impassable without chains during winter storms. Please be sure to carry chains and know how to install them. • FLASHLIGHT - With extra batteries. • BLANKETS, EXTRA CLOTHING, WATER & SNACKS - It is a good idea to take along water, food, warm blankets and extra clothing. A lengthy delay will make you glad you have them. • CLEAN, DRY TOWEL – To dry your hands after installing snow chains. • GLOVES – Helpful to protect hands from the cold when installing chains. • ICE SCRAPER/DEICER – To keep windows clear of snow/ ice for improved visibility. • SHOVEL – To free your vehicle should you get snowed in. • BROOM – A small broom or brush can be used to clear snow off your vehicle. • SPARE KEY – Many motorists have locked themselves out of their cars when stopping to put on tire chains. • SAND/KITTY LITTER – Sand or kitty litter can help with traction should you get stuck in mud or snow. WINTERIZE YOUR VEHICLE - Check and repair/replace your: brakes, windshield wipers, exhaust system and heater/defroster, radiator fluid level. Make sure your tires are properly inflated and that the tread is in good condition. Add a winter formula windshield wiper fluid to help deice your windshield. Always carry chains in good condition that are the correct size for your tires. ALLOW ENOUGH TIME – Trips to the mountains can take longer during winter, especially if you encounter storm conditions or icy roads. Get an early start and allow plenty of time to get to your destination. KEEP YOUR FUEL TANK FULL – It may be necessary to change routes or turn back during a bad storm. You may also be in for a long delay if bad weather forces a highway closure. SLOW DOWN AND USE YOUR SEAT BELT – Most winter accidents are the result of driving too fast for the conditions. Avoid speeding and buckle up for safety. Use low gears to slow your vehicle- avoid using the brakes if possible. Remember that having four-wheel drive or all-wheel drive improves climbing traction but does not help to stop your vehicle. TURN OFF CRUISE CONTROL – Don’t use your cruise control when driving in snow or wet road conditions. Maintaining control of your vehicle will allow you to react to sudden changes. ​DON’T PANIC – If you begin to slide while driving on snow or ice, slowly take your foot off the gas pedal, do not use your brakes, and steer your vehicle in the direction you wish to travel. If you must use brakes, gently pump the brake pedal and do not allow them to lock up. If your vehicle is equipped with anti-lock (ABS) brakes, apply fi rm, steady pressure without pumping. BLACK ICE – The temperature does not have to be below freezing in order for ice to form on road surfaces. Ice can form any time the air temperature drops below 40 degrees, especially when it’s windy. Bridges and underpasses can be especially hazardous. Any low or shaded area surrounded by landscaping, or with a nearby source of water, can also have icy spots. Black ice is nearly invisible. Drive cautiously. BE OBSERVANT - Visibility is often limited during poor weather. Slow down and keep a constant watch for other vehicles. When following snow removal equipment, maintain a safe distance and watch for ice and other debris. Do not pass snow removal equipment unless the operator directs you to. KEEP WINDOWS CLEAR – Passing vehicles can spray your car with mud and slush. Utilize your vehicle’s windshield wipers and defroster to keep your windshield clear. When driving through falling snow, turn on headlights for extra visibility. STAY WITH YOUR VEHICLE – When stalled, stay with your vehicle and try to conserve fuel while maintaining warmth. Put your fl ashers on, and be aware of possible exhaust or carbon monoxide problems. ﻿Adapted from the CalTrans brochure, Weathering the Storm. You can access the full brochure here.